It's kind of hard to know at this point what the end result will be in the fall veggie garden. The challenges have been numerous. "So," you say, "that's nothing new in any garden." Only this season it feels as though just when we thought we got some things right ... one more adverse element was on our heels to challenge our tenacity. 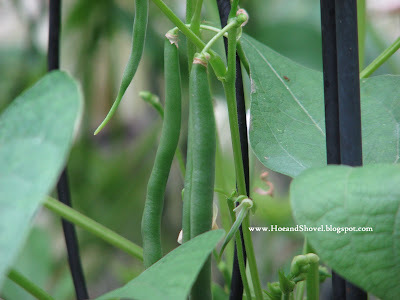 I just keep telling myself "every ounce of diligence is worth it ~~ not to have to purchase days-old green beans from the market." The voice in my head that keeps me steady through it all reminds me how very invigorating it is to pick from the vine and sauté in the skillet for a delightful yummy freshness of which there is no replica. We are happy to say we've been doing just that lately. 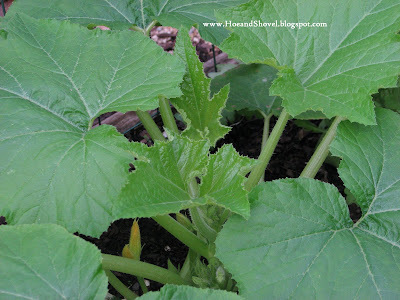 The summer squash is very happy we have finally dropped to temperatures yielding decent growing conditions. After waiting until the last possible (planting calendar) date for our zone the lettuces, spinach, carrots, collards, beans, squash, broccoli, radishes, tomatoes (started earlier in the patio) and onions were seeded. What followed were four interminably, sweltering October weeks of unseasonably high temps. Day and night. Those little seeds were begging for mercy but gave their best by popping out of the ground anyway. Bedraggled and stunted there was something else going on they were having to overcome. Somehow the armadillos, I've always had to deal with in the rest of the garden, found a way into the fenced-off veggie garden. What they discovered by rooting their ghastly snouts into all that luscious soil was a gold mine of big fat earthworms. Ahhh... midnight delicacies easily supplying these night creatures with full tummies. We managed to trap (and release into some woodlands) one of them. There are more and we are relentless in our pursuit to capture as many as we can. Some temporary fencing has been erected around each raised bed; too costly, but sometimes you have to pay for peace of mind. As the heat and animal activity took its toll it was clear some re-seeding was necessary. Most of the onions, carrots, lettuce, spinach, and broccoli just didn't have a chance given the elements against them. It was kind of comical to see the radishes moved from one side of their hill to the other. Well, I wasn't really laughing... but to an onlooker it might have been comical. The cool weather (re-seeded) veggies will probably still produce and maybe even better now that we have finally slipped into some cooler temps at night. There is possibly an up-side to all this trickery that goes into producing edibles. 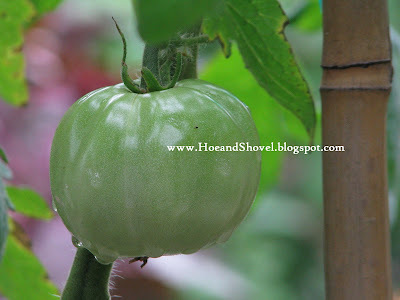 The few tomato plants that survived the unintended additional tilling by the varmints are now producing some fruit. 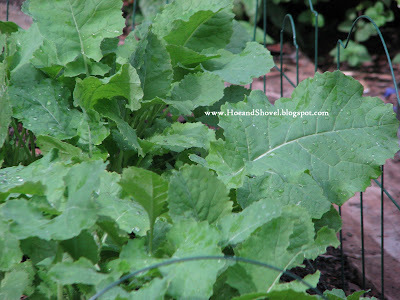 The poor collard greens must be super-tough to withstand all the nose-nudging they've endured over the weeks. I've tucked and re-tucked their roots back into the ground as they were shifted around. 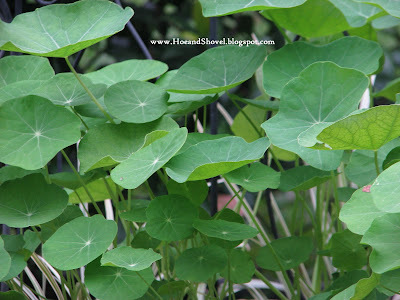 Last year I waited until spring to plant nasturtiums. 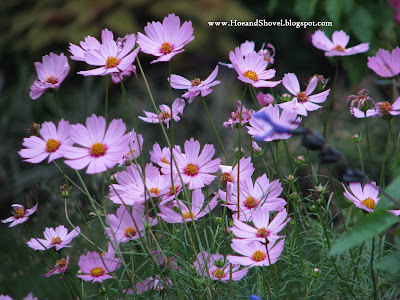 This year I'm getting a head start as I think they'll be happier longer in this milder season. Flowers soon... hopefully. 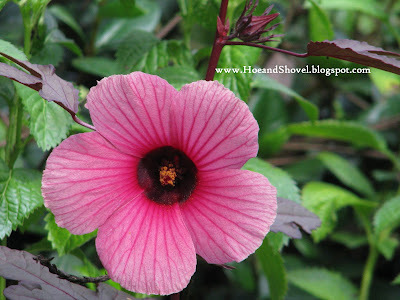 maple leaf hibiscus draw in the butterflies, bees, and flying critters of all kinds to keep everything balanced. I bet you are NOT happy with those armadillos moving around the veggies in pursuit of worms. They are cute little fellows. been to FL many times NEVER saw an armadillo. Guess if I want to see them I need to stop by your garden at night. Joking aside I hope you now have them under control. My only encounter with armadillos was in 2005 on a 100+ degree summer night in a empty campground north of Tulsa OK. I got up hearing the noise and shone my light looking for deer, once pointed closer to the ground I saw an armadillo instead of a deer. Your veggie garden looks marvelous given its trials. I also just reseeded this week-the heat and insects it brought did away with my first efforts in early October. The armadillo is quite cute, I only ever saw them twice, in zoos. 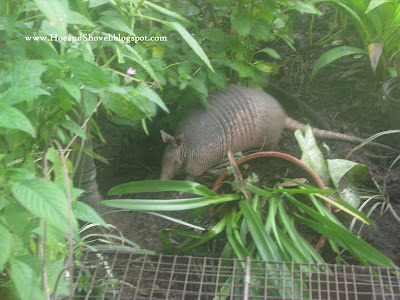 I never imagined anyone would think an armadillo was cute when I wrote this post... Ha! I suppose they are so aggravating to me there is nothing they can do to be cute to me. We are not giving up on catching these partners in midnight crime! Hi Meems, Good Luck with the veggie garden.. I'm sure your extreme heat during early fall doesn't help. BUT--now that the temps are better, maybe they will all do well. Good Luck with the Armadillos... My cousin in Melbourne has a HORRIBLE time with them---lots and lots of them. YUK! oh how i long for some homegrown veggies right now. everything looks so good. i hope you are on an uphill climb from here out. catch those armoured creatures and you will be so happy. cook and eat some green beans for me. that tomato looks like it is going to be a tasty treat. Hi Meems~~ I am both intrigued and scared of your armadillo visitor. Being from the north, I've never actually encountered one. It's interesting to observe how you southerners do gardening. While we're winding down, you're starting up. Fun. 1 down and 1 to go! What bait did you use in your armidillo trap? It was a real pleasure meeting you and your mother. I regret not having more time with you but that was not a good environment. LOUD and dirty! I wanted you to meet Sydney but it was crazy for her dealing with the plant auction. I hope you find what you need at All Native and meet Brightman. He is a great guy. Don't you just hate it when critters get into your veggies! Your plants look so well established and healthy. I just planted my tomatoes a few days ago. This year I'm trying to save the tomatoes from garden critters by planting them in those topsy turvy upside down containers. I'm crossing my fingers that they will do well and won't be discovered by any garden pillaging animals. We get the iguanas and rats in our garden. Your tenacity amazes me. 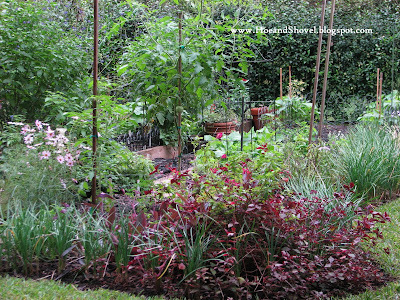 You have to love gardening to go through all you do for those wonderful veggies! Great picture of the armadillo - I haven't seen one of those for years! One thing I know at the end of the day, you will have amazing and beautiful produce. 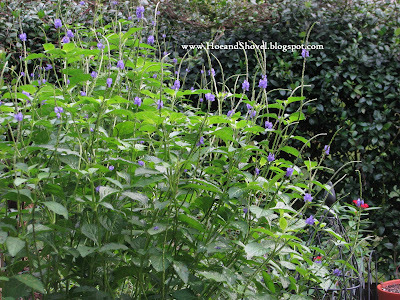 I just did more herbs this fall and they are doing great..in the same little pot we purchased in the spring. Ohhh, those darned armadillos they do have a way of rearranging plants in the garden. I just found a fresh new LARGE hole under my hibiscus plant. I looks like most of your plants are recuperating well. I just snitched one of those maple leafed hibiscus from the school's butterfly garden and am glad to discover the name for it. I love the red foliage and the flower is quite pretty, too. Enjoy your veggies! Aw, your garden marauder is awfully cute Meems. In spite of the challeges, your veggies look wonderful. Sorry about your visitor. Your veggies look scrumptious. I have seen the same varmints where I live. It's very unusual to. Snakes are no stranger either. 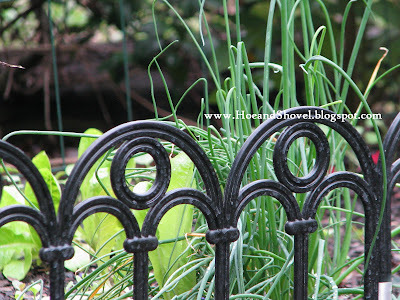 Reading this keeps me on track with the renovation of a garden becoming a edible one. It has been a long process having to move everything in this space to new homes before being at the point to let it become what the future only knows about right now. I found your blog by way of my niece KEEPING UP WITH CAROL. Although we currently live and work in South Florida, Zone HOTTER THAN HECK, we have a retirement house in North Florida Zone 8b (near Live Oak, FL). I wonder if your plantings will work for us too? Currently we are having a major problem with MOLES but was told to use a product containing castor oil in granulated form. It is all natural and I do not think it KILLS the moles but chases then away and since we do not have any close neighbors, I don't care where they go. DILLOS I am sure we have those too but I have never seen them in the yard. I am so into planning on having an organic vegetable garden but I am enclosing all the raised beds into what one would call a butterfly house. Wood framed with hardware cloth or chicken wire over kind of like a greenhouse with screening, very chez Charleston BUT until we can move to North Florida full time my notebook keeps getting thicker with more and more ideas. We used to have an Armadillo that visited my backyard every night. You could see him walking down the powerline. My dogs chasing him keeps him away now. If that doesn't work there are some good Cajun recipes like Armadillo in mustard sauce online. Just the thing to go with all the veggies. Armadillos are so bizarre looking, they're CUTE! But probably not so cute when they're tearing up the gardens. I'd love to see one in real life, though.